Cabin Rental $70.00,$75.00 one room $85.00 two room plus tax weekly and monthly rates available No pets, no smoking,nocooking in cabins. NO REFUNDS ON EARLY DEPARTURES *** Preferred Cash rate, site only 10% discount applies Sun. – Thur. non-holiday onlyNo outside wood allowed to be brought in. 2 cars per RV site (park on your site only). 1 car per tent/pop-up site (park on your site only). Use of motorcycles and mini bikes is restricted to entering and leaving the park. 2. SPEED LIMIT IS (5) MPH for all vehicles. Permitted until 7:30 p.m. only. NO EXCEPTIONS. (5) MPH speed limit. 4. Quiet Hours are 10:00 p.m. till 8:00 a.m. please be considerate of campers who want to retire early. No unnecessary noise at any time. 5. Sheds, fences or rigid structures are not permitted. All items stored must be on site by opening weekend. All building must be pre-approved by office. 6. Nails, hooks or any type of attachments that will deface trees are not allowed. 7. Stay off docks at all times (except your own). 8. An adult or responsible person to wash room must accompany children under nine 9. Playground closes at 8:30 p.m. and remains closed until 8:30 a.m.
public areas. Short leash only. Vaccination papers required. b. Do not feed wild animals or fowl at anytime or for any reason. c. No dog walking on other peoples’ property. 11. 8-day CANCELLATION POLICY - no refunds for early departure. Except holidays and cabin rental – 15day prior cancellation policy. 12. Boats to be in water or designated parking area, not on your sites. 13. There are swimming rules !!! Check at office for your permit. Swimming only in designated area. 14. 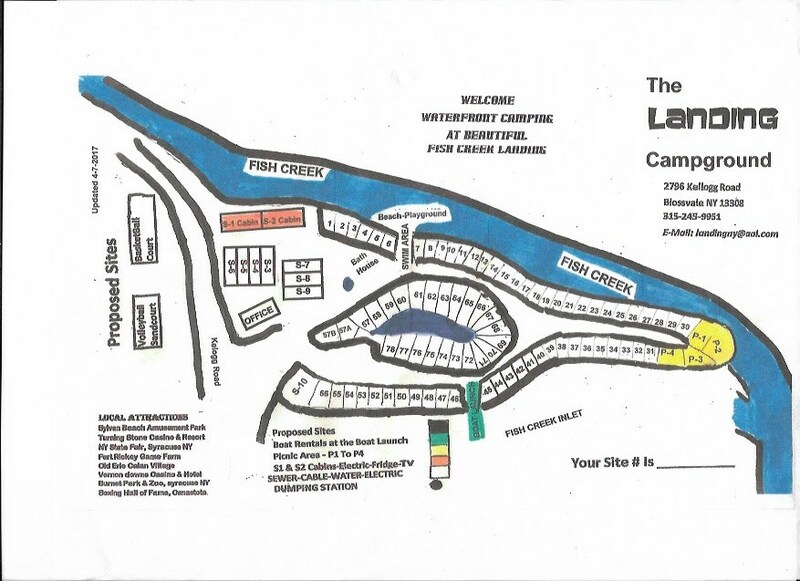 No washing of vehicles or trailers on the campground. 15.Outside refrigerators must be approved, in good working condition & padlocked. 16.Please be green we must recycle paper, cans, bottles, metal all other garbage brought up to the dumpster. No burning of garbage. 18. No call, no show for any reservation, will result in a non-refundable penalty. Credit Card will be billed. No refunds on short stays, whether it is guests choice or managements choice. A complete list of rules is available in office.